p. 52-53 All the items listed here were available from druggists during the late 18th century. The recipe for the Electuarium Gingivale is taken from The New Edinburgh Dispensary, published by The Royal College of Physicians of Edinburgh, ‘being an improvement on that of Dr Lewis by John Rotheram (M.D., the Younger)’, the son of the Dr Rotheram of Newcastle whom we shall shortly meet. The quote regarding kermes is from the entry ‘Medicine’ in the Encyc Brit. II. p.53 Electuarium Gingivale; a recipe can be seee HERE. This is from The Edinburgh New Dispensatory … being an improvement upon the New Dispensatory by Dr Lewis, 1794, a work written by John Rotherham (M.D., the Younger) whose father we shall soon meet. p. 58-60 The story of the Newcastle water supply is outlined in a collection of transcriptions from various correspondence and meetings (including the full text of Tytler’s oath, mentioned on p.60) that is now held in the Library of The Mechanics Institute in Newcastle, and it is this that has provided the background to a series of letters that were exchanged between Tytler and Rotheram in the Newcastle Courant during 1770. Whatever the full details were and they are unlikely to be revealed now, there was clearly some corrupt practices going on, on one part or the other; whether Tytler was knowingly involved seems unlikely, but we shall probably never know for certain. What is clear is that Tytler had already acquired a skill in acerbic criticism of a kind with which Gilbert Stuart had been livening up the Edinburgh literary scene when Tytler had been there. p. 61 The opening quote is from the entry for Edinburgh in the Encyc. Brit. II. Excerpts from Fergusson’s long poem Auld Reekie can be read HERE, along with a review of his life and work. p.65-67 The story of the Edinburgh Bedlam is a confusing one. 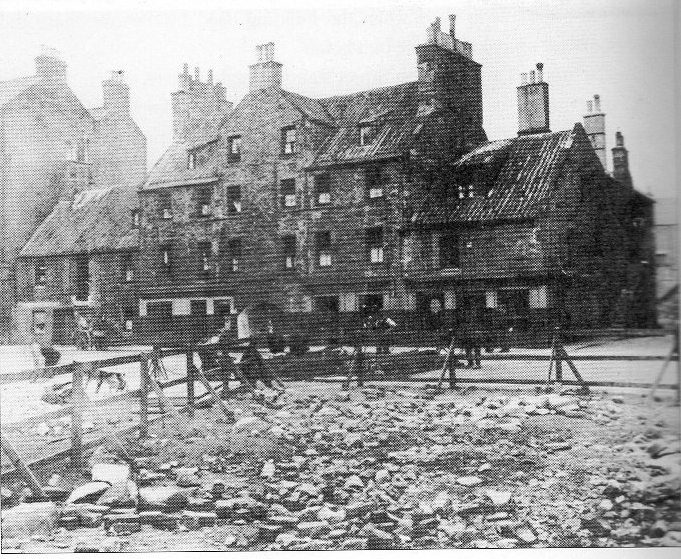 Notes to the published edition of the Edinburgh Burgh Records xxxiv ‘ A place for the insane, known later as bedlam, had been added to the Correction house [at the foot of Leith Wynd] in 1675… In 1695 two houses were built int South Greyfriars Yard, each to house 20 ‘poor’. ‘Without notice of any preliminary discussion the Town treasurer on 15th june 1698 was authorized to draw up a contract for building a bedlam house or hospita at a cost of £8000 Scots… Unfortunately this was never inserted in the minutes nor was the building again referred to as bedlam. Apparently it was put to different uses ; Cassell says the building was called Darien House, although the offices of that ill-fated company were certainly located in a different part of town. The Charity Workhouse was built in the grounds 1743 and a subsequent series of maps show various arrangements of building in the south-west corner of the site, later ones of which designate the ‘Darien House’ building as a Childrens’ Hospital, apparently for children from the Workhouse and new buildings seem to have been built to accommodate the ‘cells’ of the ‘insane’ as well as a ‘House of Correction’. 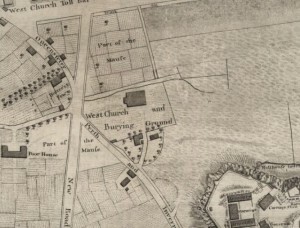 More information pn the history of the site comes from The Book of the Old edinburgh Club vol. 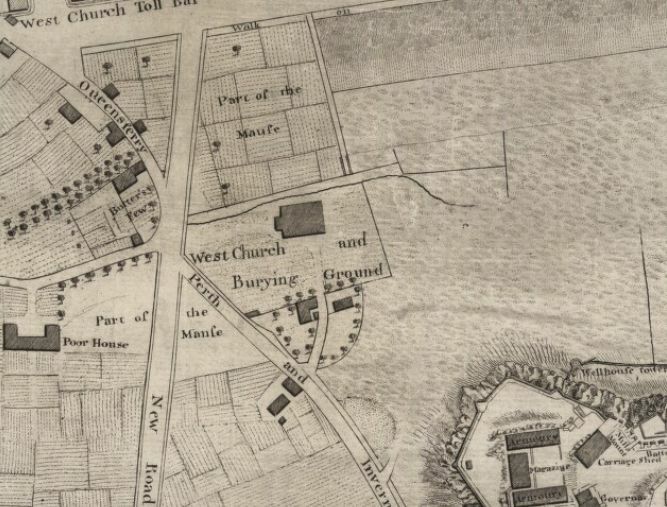 22 ‘The foundations pf the new workhouse were laid in 1743 on the site of the present Drill Hall [which still exists]. the original bedlam was now used as an infirmary for the sick and a hospice for the children. South of it there was erected in 1746 a new Bedlam with 21 cells for lunatics and an apartment which was used as a house of correction. On the west side of this new building was a ‘textoratory’ or weaving school built in 1748. between these buildings and the workhouse was a handsome garden, divided by a path which led to a postern gatee in the City wall, giving entrance to ‘Hope’s Park’ or the Meadows; at the gate hung a collection box.’ Private residents in the Bedlam were charged £8. 10 shillings a year. Other private ‘mad-houses’ existed but were far more expensive, as well as over-crowded. A number of images of the Workhouse, of Bristow port and of ‘Darien House’ can be found in Cassell’s Old and New Edinburgh. p. 65 Dr Duncan and his role in the Bedlam an in Tytler’s life are described in the note to p.68 below. p. 66 The verse here is from a poem published in the Gentleman and Lady’s Magazine after Fergusson’s death. It seems to have been copied form the article in Ruddiman’s Edinburgh Review. p. 69 the death of Fergusson had a powerful affect on Dr Andrew Duncan, then contemplating the beginnings of what was to become the Edinburgh Dispensary. He succeeded in getting a new asylum built in Edinburgh in 1807. Details of his life are HERE and a thoughtful appraisal of his relationship with Fergusson is HERE, including the text of a letter he wrote, from which much of his words here are taken. p. 70 that Tytler worked in Duncan’s Dispensary is recorded in the mortuary notice of May Cairns death [see page 71]. The story of the Dispensary is told HERE. Students assisted at the dispensary, including Charles Darwin, the unfortunate uncle of the better known Charles Darwin. This poor youth died, aged 20, from an infected finger that was cut while he was dissecting a child’s brain. Duncan must have felt fondness for this Darwin, since he was buried in the Duncan tomb in Buccleuch Cemetery. 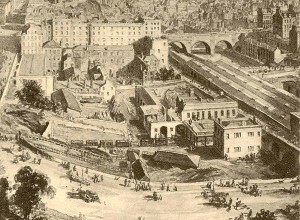 p. 73 Canal Street was situated, ‘under the new bridge’ where Waverley Station now is. 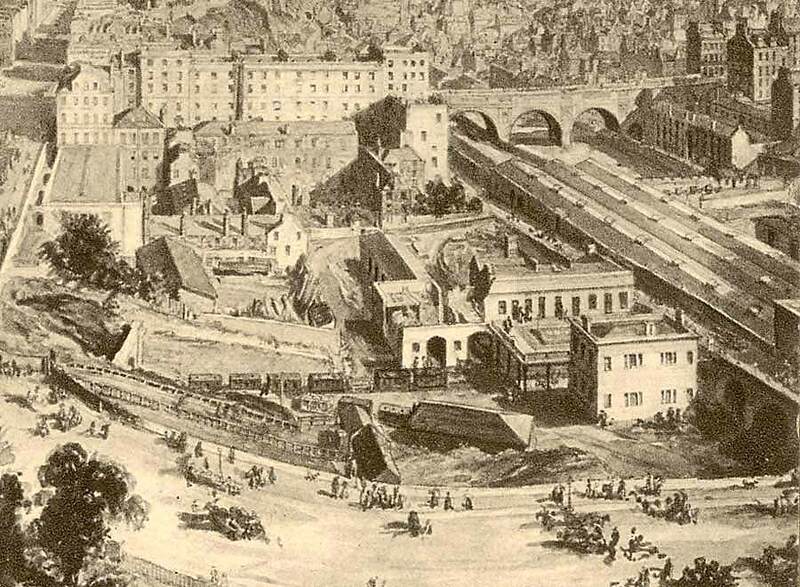 It was so named because it was intended to front an extension of the proposed Union Canal. 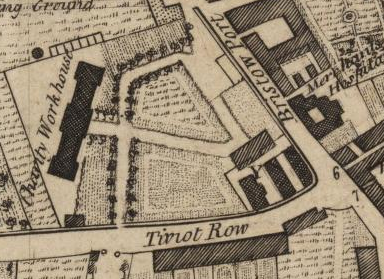 the idea, according to Cassell (Old and New Edinburgh, Vol III, p. 29) was to link the twon centre with Leith, and create a large harbour at Greenside (below where the Car-park now is). Work on the canal, which eventually was planned to run down the centre of the new Gardens to the south of Princes Street was begun, but was never pursued. Peter Williamson’s Directory. Williamson (of whom more on p. 103) produced Williamson’s directory for the City of Edinburgh, Canongate, Leith and suburbs from 1773 until the 1790’s. many volumes, including the relevant ones here, are online HERE. The ‘illuminations’ were ‘ordered’ by the council; lights were to be put in all windows to celebrate the presentation of the freedom of the City to Rodney, after Rodney successfully relieved Gibraltar during the Great Siege and defeated a Spanish fleet during the 1780 Battle of Cape St. Vincent. His subsequent career was regarded by some as rather less illustrious, it being argued that he was more interested in prize-money than in ‘services to his country.’ His life and achievements are documented HERE. St Cuthbert’s Cemetery: The site of May Cairns grave can still be paced out; the ground is undisturbed, though some small monuments exist in the area surrounding it. p. 76 The King’s Birthday: Fergusson’s poem is HERE; as the notes to this edition point out ‘it is to be regretted that on such days of festivity the lower classes seldom indulge their mirth without mischief’.